Fantasy Football Quarterback Start/Sit Rankings (Week 5) - Fantasy Football, Fantasy Football Rankings | Mac Bros.
1. 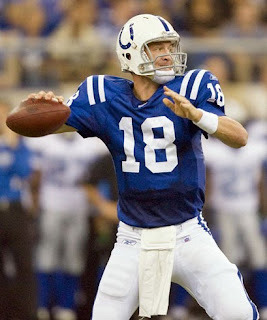 Peyton Manning (IND) – He has now thrown for 300 plus yards in each of his four starts this season and Manning can easily be regarded as the NFL’s top fantasy signal caller through the first quarter of the season. Look for Mr. Consistency to continue the trend in a promising week 5 match up against a Tennessee defense that ranks dead last in the NFL against the pass. The Titans have been shredded through the air on a weekly basis and now it’s Manning’s turn. He is a no brainer for week 5 fantasy rosters. 2. Matt Schaub (HOU) – Sure, he was less than spectacular against Oakland, but through no fault of his own, Shaub’s services were hardly required in a second half in which the Texans were in complete control. Fortunately, a week 5 meeting with Arizona should inspire the exact opposite as this game is likely to turn into a shootout between two high powered passing attacks and come down to the wire. Even better, the Cardinals have a notoriously poor pass defense that ranks 30th in the NFL. Schaub is a must start for week 5 with one of his more promising match ups of the season. 3. Ben Roethlisberger (PIT) – He has progressively increased his fantasy production on a weekly basis and that trend should continue into a favorable week 5 match up against Detroit. The Lions currently rank 25th in the NFL against the pass and have allowed no less than 2 passing TD’s in a game all season. They have given up a league worst 12 passing TD’s in just 4 games. Roethlisberger should be penciled into fantasy line ups as an excellent week 5 starting option. CLICK HERE TO VIEW THE ENTIRE TOP 25 FANTASY FOOTBALL QB RANKINGS FOR WEEK 5.